Red Fox Fur Blanket from Canadian Red Foxes "Winter Magic"
Red Fox Fur Blanket from Canadian Red Foxes - "Winter Magic"
Turn cold and uncomfortable days into a cozy, cuddly evening with our red fox fur blanket from Canadian red foxes. The bright shades of these unique Canadian red foxes are gorgeous wild furs. The red fox comes from the wilderness Canadas, and it has full and soft hair. Both optically and haptically, the red foxes are a pure pleasure, which will enchant you. 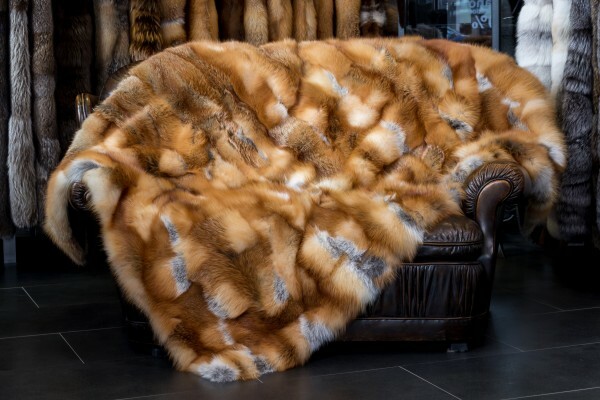 Convince yourself of the exclusivity and unique feature of this red fox fur blanket from Canadian red foxes, which was processed by hand in our master workshop in Kiel. The red fox fur blanket can be used as a bed blanket, or as a decorative throw on your bed or sofa. If you have any questions or requests, feel free to contact us at any time. Related links to "Red Fox Fur Blanket from Canadian Red Foxes "Winter Magic""
Customer reviews for "Red Fox Fur Blanket from Canadian Red Foxes "Winter Magic""